The Kern Valley River Council (KVRC) was formed to help preserve and enhance the ecological, economic, recreational and aesthetic values of the Kern River. Since the dawn of civilization rivers have been the focus of use and resource issues. Issues such as pollution, access, right to navigate, dams and water diversions are just a few. Your support of the Kern Valley River Council helps to provide a unified voice and the funds necessary to work towards a positive resolution of important river issues. All officers and most other individuals that work for the KVRC are volunteers, so that all funds received go to these worthy causes. KVRC hosts river events such as the annual Kern River Festival, the 2003 Wildwater World Cups, and the 2005 Pan American Whitewater Slalom Championships and U.S.A.C.K. Whitewater Slalom Nationals. These activities are not only a source of funds used for conservation purposes, but also help involve and educate paddlers and the public regarding river use, issues, and conservation. As a non-profit membership organization, KVRC has also received limited grants that helps us to achieve our goals. Kern Valley River Council (KVRC) was recently awarded a $25,000 grant from the USFS, Secure Rural Schools and Community Self-Determination Act. 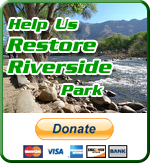 The Kernville Riverside Park Renovation Project's goal is to enhance the ecological, aesthetic, and recreational value of the 1/4 mile stretch of the Kern River starting just above the Kernville Bridge, through Riverside Park in Kernville. Currently, KVRC is involved in a major project involving several organizations in the Kern Valley, the “CLEAN RIVER PROJECT”. This long-term project utilizes the resources of many groups, including the U.S. Forest Service, volunteers to do physical cleanup work, and local businesses. KVRC is helping with providing additional funding, along with additional trash service and people to work in areas that no service is available or can be provided by current operations. Another KVRC project was the development of a permanent slalom race and training site at Miracle Hot Springs on the Lower Kern River. From this site, KVRC is be able to provide a prime location for training of paddlers and slalom athletes, including development of cadet and junior paddlers. Miracle was one of the primary slalom training sites of 2004 Olympic Silver medalist, and Kernville resident, Rebecca Giddens. Although a young organization, the members are seasoned and experienced conservationists, dedicated to the cause of educating river users, and preserving and enhancing the quality and beauty of this wonderful river.